Congratulations! You’re a few simple steps away from owning a great little synth that will serve you for years and that you’ll have the satisfaction of having built yourself. Building this project takes about 90 minutes if you’ve done some DIY electronics before, complete beginners should expect to take a little longer. The instructions assume that you can identify components, solder and do simple voltage and continuity tests with a multi-meter. There are lots of resources available to help you learn these skills – just hit Google or YouTube and you’ll soon be ready to start! 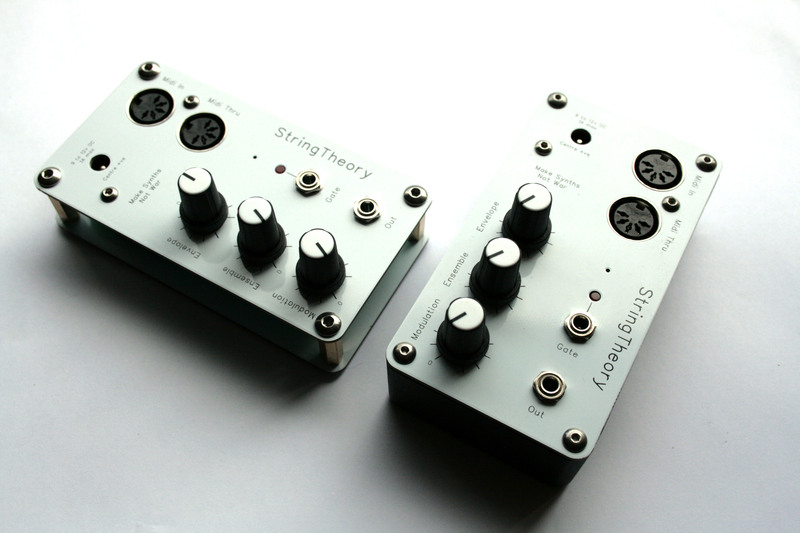 Enjoy building your StringTheory Synth, we hope you make great music with it! You’ll also need a clean, well-lit workspace with a heat-resistant surface to work on. 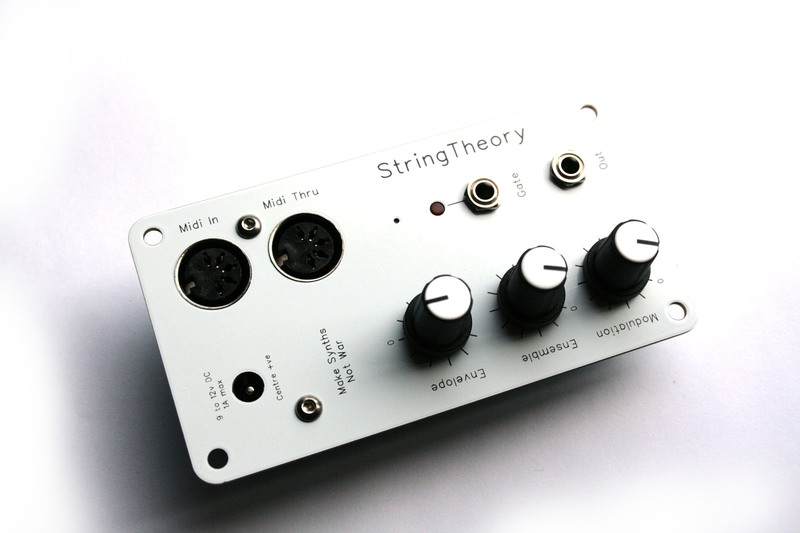 Putting StringTheory Synth together is relatively straightforward; the parts count is fairly low and the parts are easy to identify. 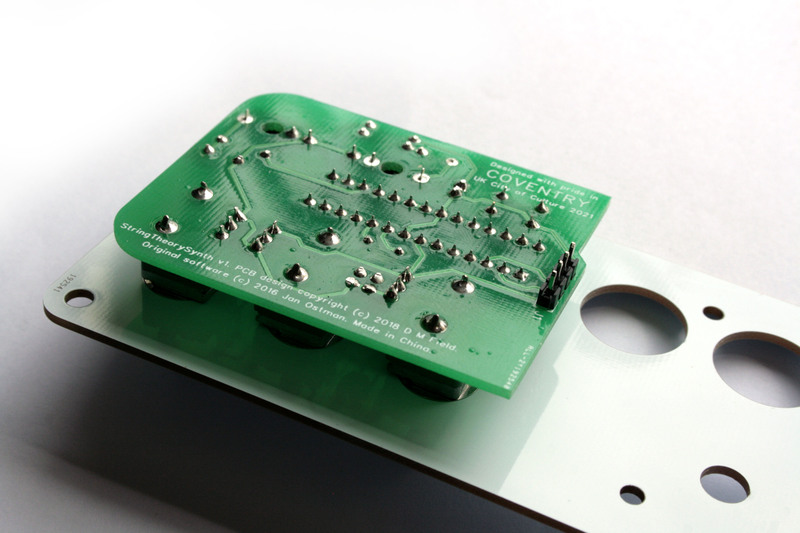 All but one of the components go on a single side of the PCB – so, as a general rule – parts go on the side of the PCB that has a marking for them. 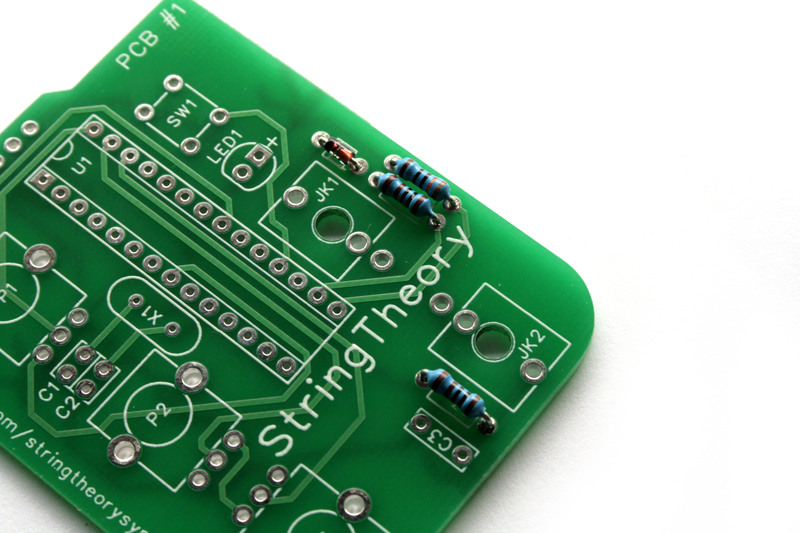 Solder parts into the marked positions; where a part has to go a specific way round there will be markings on the PCB to guide you, and a clear note in the instructions. Typically we add parts to the board in height order, starting with the shortest parts (this makes the PCB easier to manage and handle during the build). We’ll only deviate from this approach occasionally where it’s sensible to do so. Locate the position for D4. Diodes have to be inserted the correct way round – so make sure that the black bar at one end of the diode matches the bar on the printed symbol. Set the diode into place, check it, then flip the board over and solder it into place. You can tidy the wires now with a pair of cutters or do them later (I tend to do mine as I go along as it makes the PCB easier to photograph). 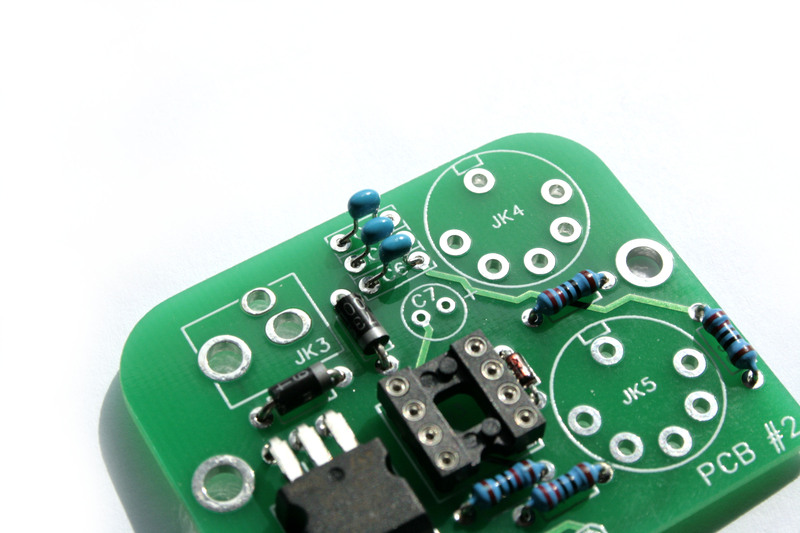 The resistors on this board are dotted around the JK5 position. Refer to the Bill of Materials to see which values go where (if you’ve bought one of our kits, you’ll have found that all of the parts are clearly labelled). Make sure that you put the correct values in the right places – check them against an identification chart or with a meter if you’re unsure. Solder all of the resistors into place once you’re certain you know what goes where. It doesn’t matter which way round they go as long as they’re in the right location. Like D4, these diodes have to be inserted the right way around – make sure that the white bar at one end of the diode matches the bar on the printed symbol. Check them again before you solder. These might be a little trickier to solder than the components that you’ve done so far as they soak up quite a lot more heat; if you have an adjustable soldering iron, it’s worth giving yourself an extra few degrees for this part of the job. This component takes the incoming voltage of 9 to 12 volts DC and brings it down to a nice, steady 5V. It’s important that it goes in the right way round, but if you take a close look at the photo you’ll see there’s only one way it will actually fit. First thing you’ll need to do, though, is make it bend at the knees. 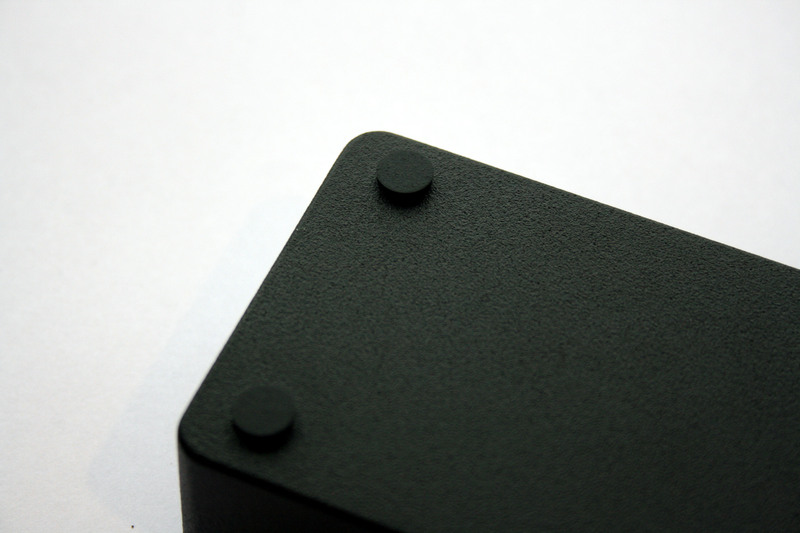 Hold the component so that the flat, metal “back” is away from you, the black resin “front” facing you. The components legs are wider at the top – about a millimetre below where the wide part of the leg ends, bend the leg 90 degrees away from you. Do this for all three legs – you can use pliers or even just the straight edge of a ruler to do this. 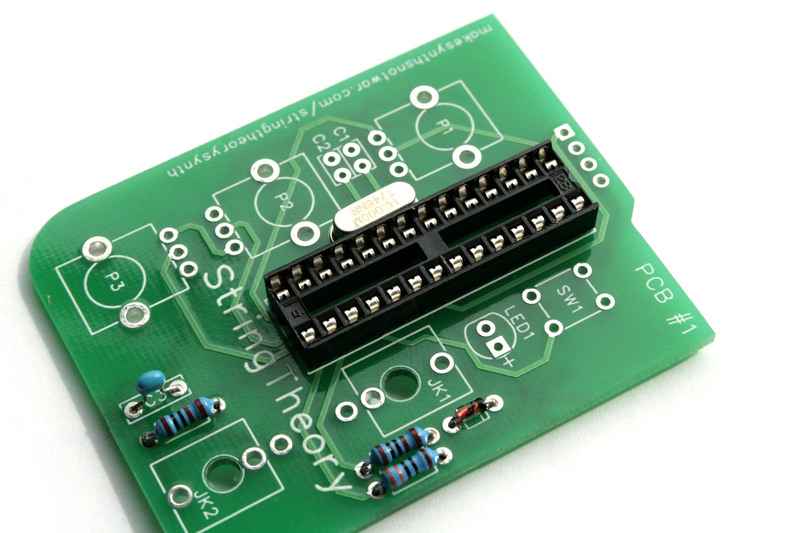 You should now find that the legs fit straight into the holes in the PCB and the flat “back” of the component sits flush on the exposed area on the PCB – the holes in the component and PCB should line up, too. 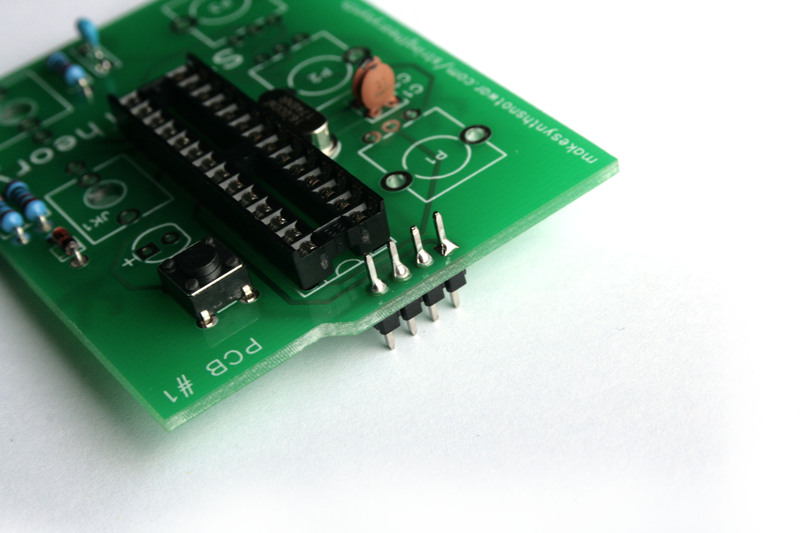 Although it’s not essential to bolt the component to the board, it’s worth doing – if only to help keep it still during soldering. Use an M3 machine screw and nut if you choose to do this. We don’t solder Integrated Circuits (“chips”) directly to the board – the heat would damage them. Instead, we use these IC sockets. 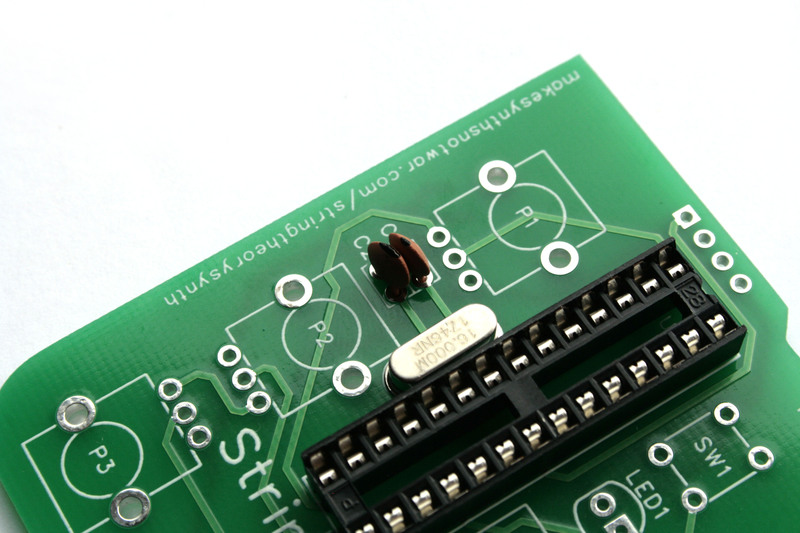 Make sure that you line up the notch at one end of the component with the notch marked on the PCB silkscreen, as this helps us identify the pins for testing and ensures that we put the ICs in the right way later. Holding these in place whilst turning the PCB over can be tricky – I usually locate the socket in the PCB, put a piece of card over it, then turn the PCB and card over at the same time – this holds the socket in place. Slip the card out from under before you start soldering, though. Make sure that you don’t miss any pins when soldering. Locate the 3 ceramic capacitors C4, C5 & C6 & C4, position them and solder them into place. There’s no “right way round” for this type of component. Electrolytic capacitors are polarised – they have a positive and a negative connection and these have to be the right way round. 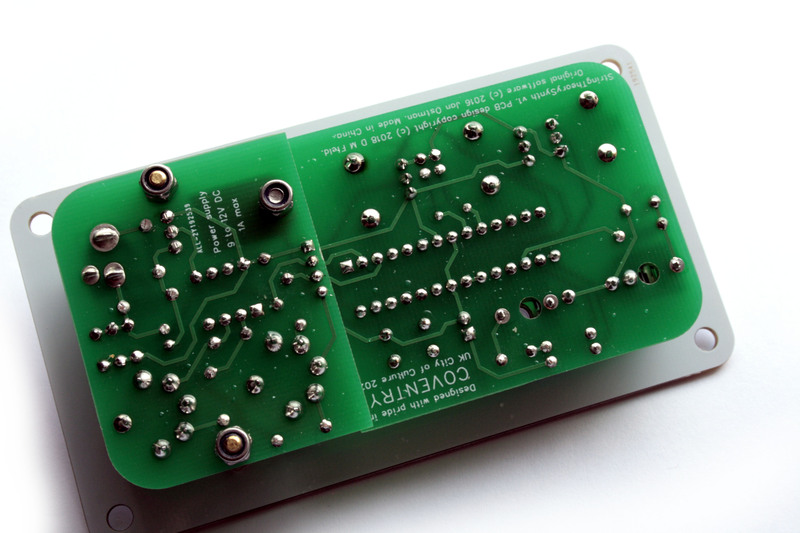 Find C7 on the PCB – you’ll see that one hole has a “+” symbol next to it. This shows that the positive pole of the capacitor should connect here – the other hole is, therefore the negative. So, put the long leg of the component into the hole marked “+”, push it down snug to the board and solder it into place. Attach a post into each of the two M3 holes and secure it in place with a nyloc-style nut. 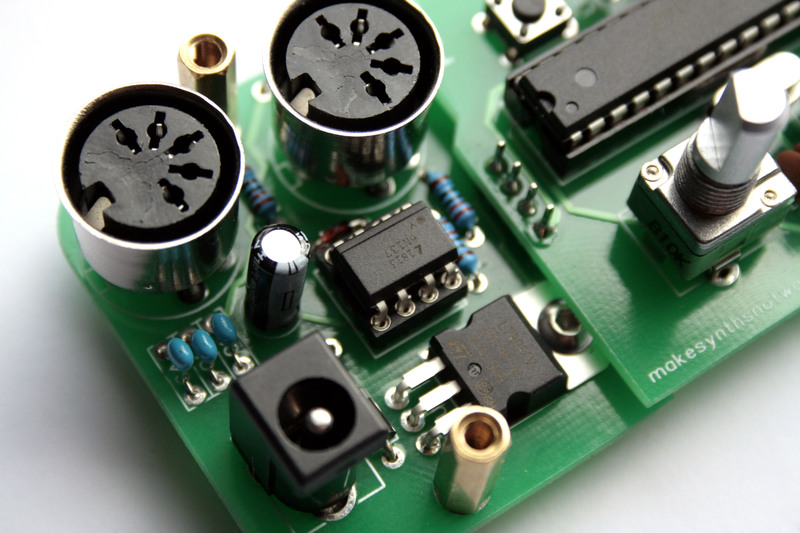 Make sure they’re nice and snug but don’t overtighten – you don’t want to crush the PCB. With this done, you can now tidy up the back of the board (if you’ve not done it already) and set PCB #2 aside; we’ll come back to it later. The next few steps take place on the other PCB in the set, marked “PCB #1“. Locate the position for D1. Diodes have to be inserted the correct way round – so make sure that the black bar at one end of the diode matches the bar on the printed symbol. Set the diode into place, check it, then flip the board over and solder it into place. 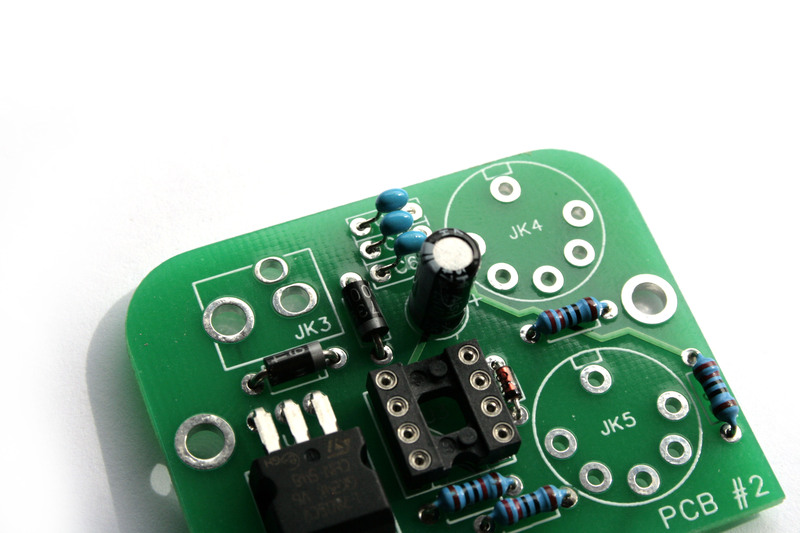 The resistors on this board are located around the JK1 and JK2 positions. Refer to the Bill of Materials to see which values go where (if you’ve bought one of our kits, you’ll have found that all of the parts are clearly labelled). Make sure that you put the correct values in the right places – check them against an identification chart or with a meter if you’re unsure. Solder all of the resistors into place once you’re certain you know what goes where. It doesn’t matter which way round they go as long as they’re in the right location. Locate and position the 16MHz crystal, then solder it into place. This component can be oriented any way round. 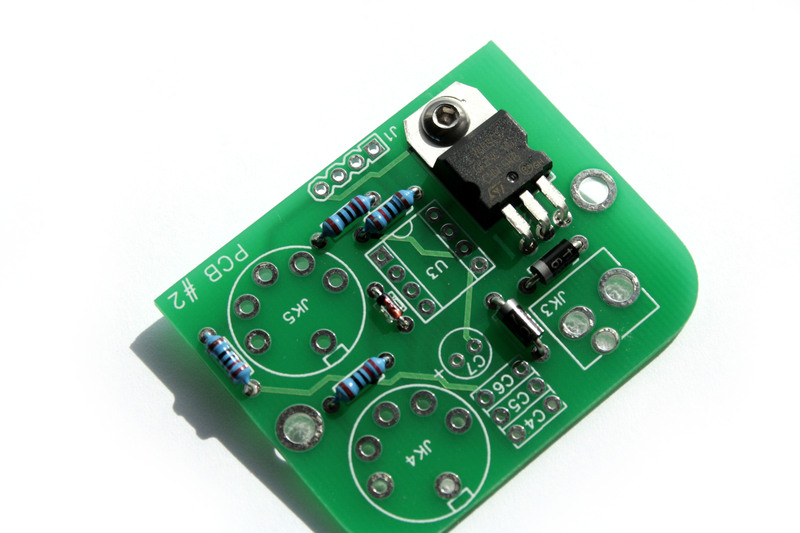 Locate the ceramic capacitor C3, position the component and solder it into place. There’s no “right way round” for this type of component. These capacitors can be positioned either way round. Position them and solder them into place. 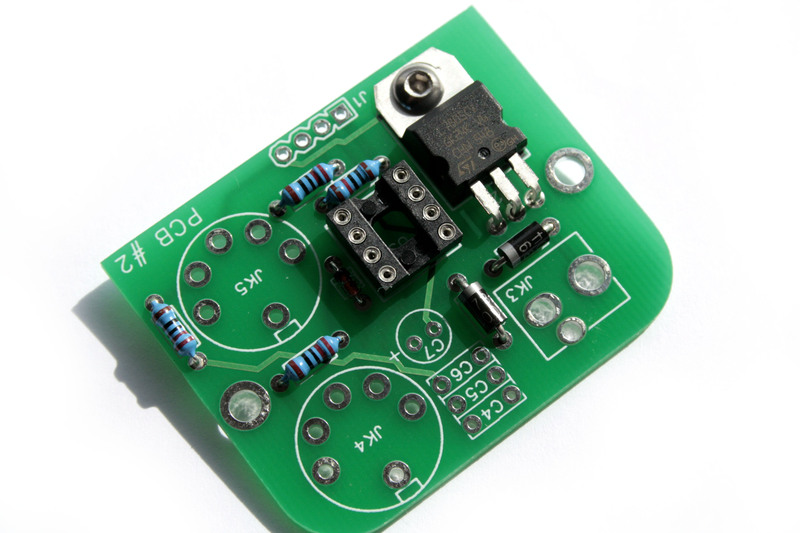 Locate and position the 6mm tactile switch. You’ll find that the pins are spaced to ensure that you get the correct orientation. Snap it into place, then solder it. 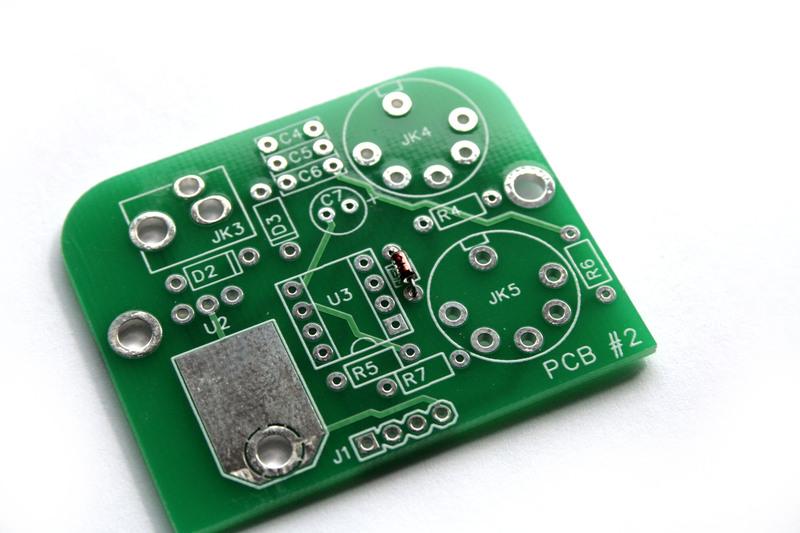 This header will join our two PCBs together. It’s the only component that goes on the other side of the PCB. 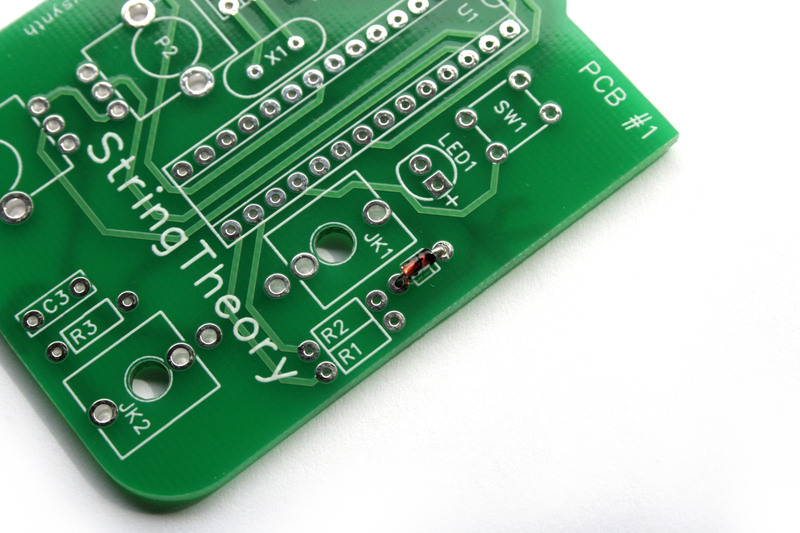 Flip the PCB over, and insert the long side of the header into the holes. Turn the PCB over again and solder into place. We’re now ready to start adding the final few components which will join the PCBs to the front panel, so make sure that you have your panel to hand for the next few steps. For this step, we’ll position all of the remaining parts and then “sandwich” them between the PCB and panel before soldering them. Snap all three of the potentiometers (“pots”) P1, P2 and P3 into place. All three are the same value. Each one will only fit the way its intended to. Locate and position JK1 and JK2. When positioned correctly the pins will all locate and the bodies of the jacks will match up with the printed outline. Locate and position LED1. The long lead goes through the hole marked “+”. Allow the LED to sit against the PCB, then widen the leads slightly so that it stays there while we work on other parts. With all of these components in place, place the panel over the top of them and spin a washer and nut onto P2. Don’t tighten it right up, we just want to make sure that our parts don’t move around too much while we solder them. Check that everything is nicely positioned, then turn the whole assembly over and solder P1, P2, P3, JK1 & JK2 into place. Then position the LED (if you’re using our recommended flat-top LED set it up to be flush with the face of the panel) and solder that into place too. Leave this assembly in place; next we’ll add PCB #2 to the assembly. 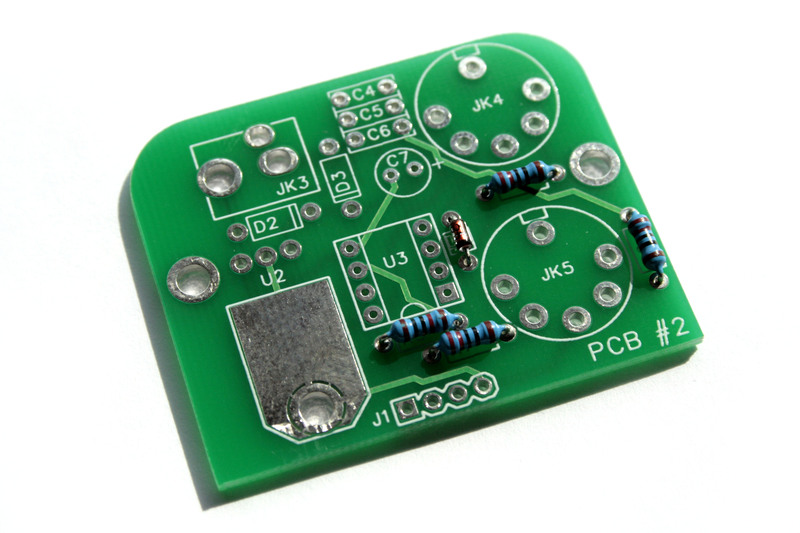 On PCB#2, put JK3 in place but don’t solder it yet. Fit PCB #2 into place, sandwiching JK3 between the PCB and front panel. 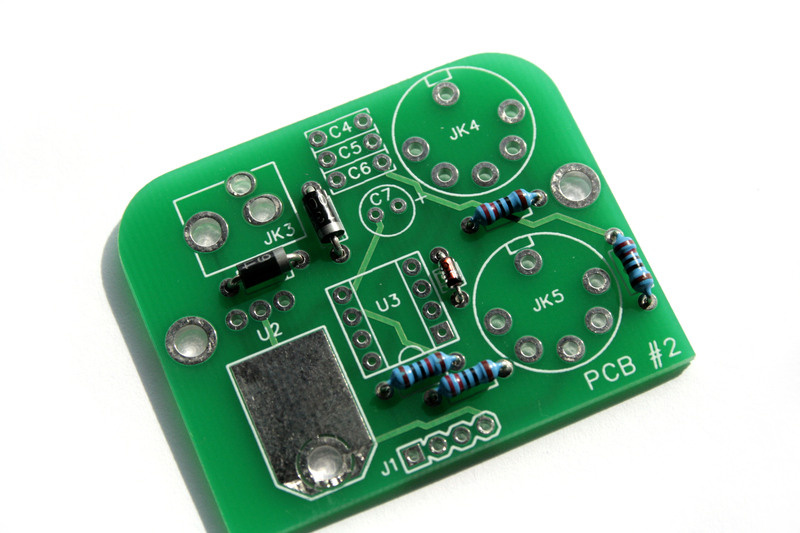 Ensure that PCB #2 overlaps with PCB #1 and that the pins from J1 fit through the marked holes. Using two M3 machine screws fix PCB #2 to the front panel. Don’t tighten the screws up beyond finger-tight as you’ll need to remove the panel again in a minute. Ensure that the DC inlet hole in the panel and the hole in the component align nicely; jiggle JK3 around a bit if you need to. Plugging in a DC plug can be useful here, too – but make sure it’s not connected to mains! When you’re sure you’ve got it aligned, flip the whole thing over and solder JK3 in place. The holes for the pins are pretty big so be generous with the solder, remembering to heat the pin, the pad and the solder all at the same time to ensure a good connection. Solder the pins from J1 to PCB #2. It’s time to add the MIDI connectors. One at a time, gently drop JK4 and JK5 into place (you might need to give each a bit of a jiggle or manipulate the pins a little to get it to seat properly). When it’s in place, you should find that the metal rim of the jack sits less than a millimetre proud of the top panel. Flip the board over and solder the jacks into place. That’s all of the soldering done! Unfasten the M3 machine screws and the nut around P2 and remove the panel – take care as the connection between the two PCBs is quite slender and fragile! You’re almost there – but first we need to give the build a quick test to check that it’s good to connect to power and that it’s OK to fit the ICs. 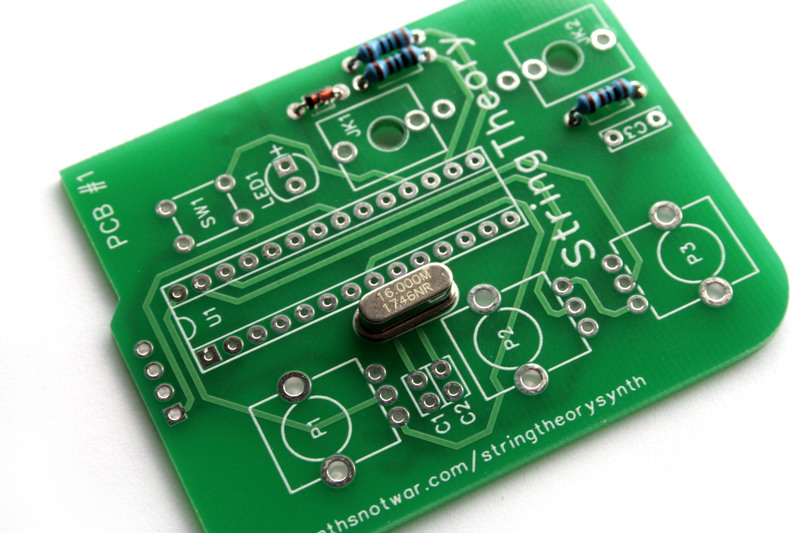 Before we connect the StringTheory Synth to a power supply, we’ll make a quick test for short-circuits. You’ll need your multi-meter for this step. Ensure that there is NO continuity between pins 7 and 8 of the U1 IC socket. 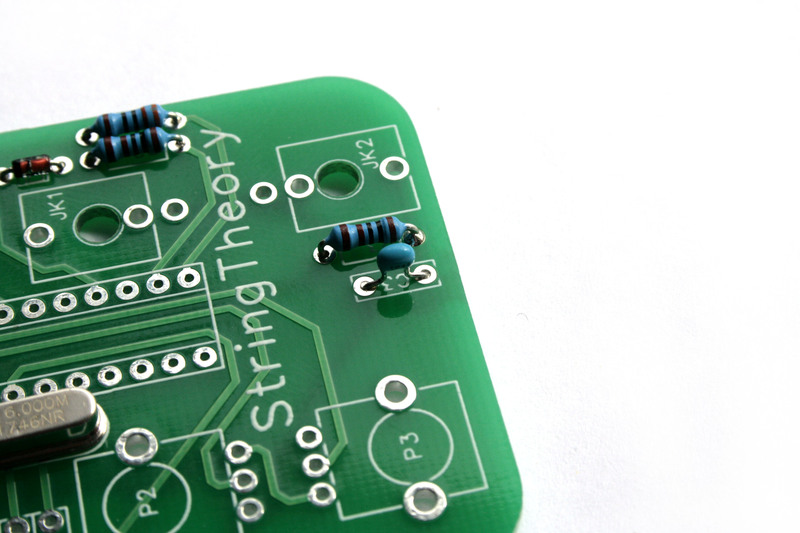 If your StringTheory passes this test, it’s safe to connect it to your power supply and continue with the next set of tests. If it fails this test, take a good look over your PCB for shorts between soldered connections. Rectify and try again. 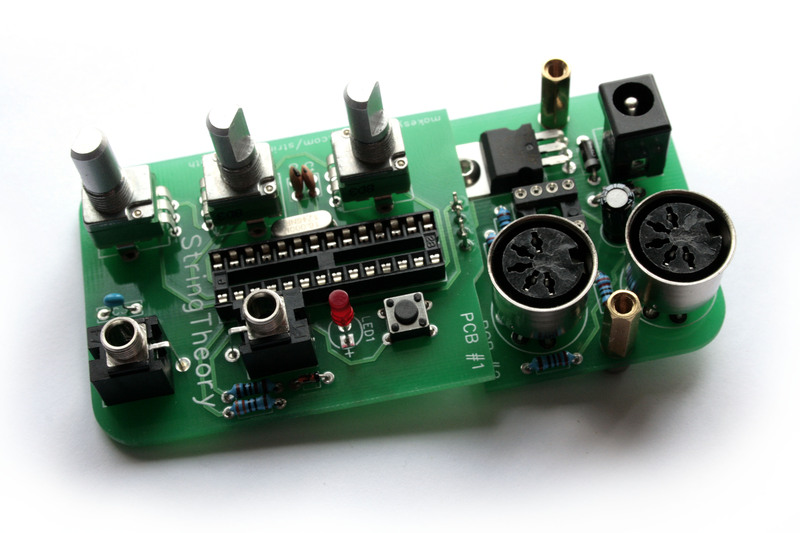 Connect your StringTheory Synth to power with a suitable 9-12V DC power adaptor. Touch your meters BLACK probe to pin 8 of the U1 IC socket. Touch the RED probe to pin 7. You should measure approximately +5V here (a small amount of drift is acceptable). 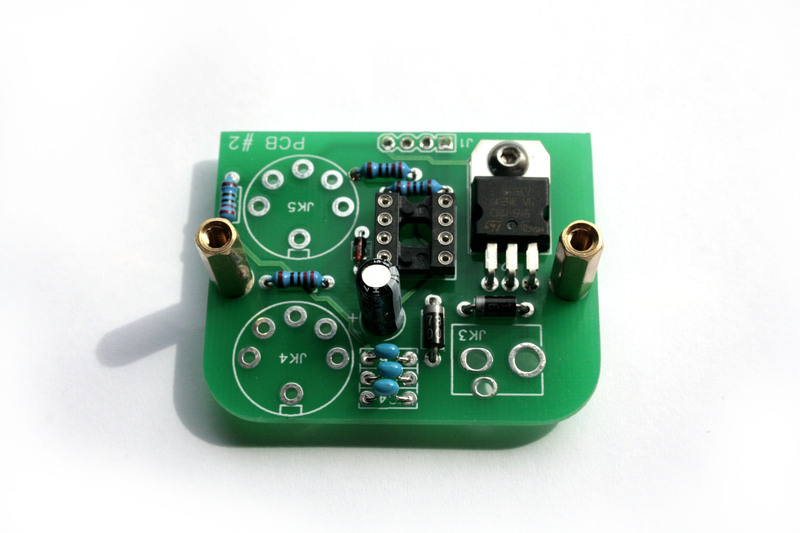 +5V here means that your power is going to the right places and you’re good to finish up. Skipping these tests, carrying them out improperly or ignoring the results can carry serious risks and consequences for you and your equipment. 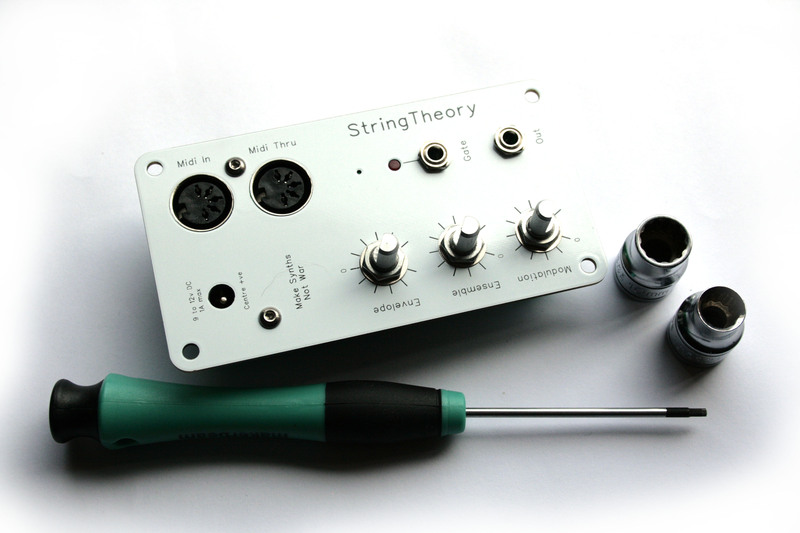 In proceeding to connect StringTheory to your equipment, you are assuming liability for any consequential loss or damage. If you bought your ATMega328P-PU IC from us, it will already have the latest firmware on it. If you’ve obtained your own, you’ll have to program it yourself before you can use it, so do this before proceeding any further. Insert the ICs U1 and U3 into their sockets. These have to be properly aligned – this is where making sure the sockets were installed correctly pays off. The U1 IC will have a notch in one end. Match this to the notch in the socket, then gently but firmly insert the IC into place. Note that you might need to narrow the splay of the legs a little with some gentle finger pressure first. The U3 IC will have a solid printed dot in the corner that holds pin 1. Align the pin 1 end of the IC with the notched end of the socket, then gently but firmly insert the IC into place. Again, you might need to adjust the legs of the IC a little first. Fit the panel back into place. Secure the pots and jack sockets with the washers and nuts provided. A socket is ideal for tightening these without damaging your panel – you only need to go finger-tight. Use a hex tool to re-fit the two M3 machine screws that hold PCB#2 in place. Finally, fit your knobs to the potentiometer shafts. If you’ve used our specified pots and knobs (or if you’ve bought one of our kits), these will be simple push-on D-shafts. With the knobs on, rotate all of the pots fully counter-clockwise and then set the end-caps with the pointers pointing in the right direction, then snap them into place. If you’ve bought self-adhesive feet, fix one in each corner of your enclosure and give them a good press into position. Now turn the box over and place the finished StringTheory Synth assembly into position. Use the four machine screws that came with your panel to secure the whole thing in place. Alternatively, if you’ve got one of our NiceBottom enclosures, now is the time to unpack it and follow the instructions for putting it to use. 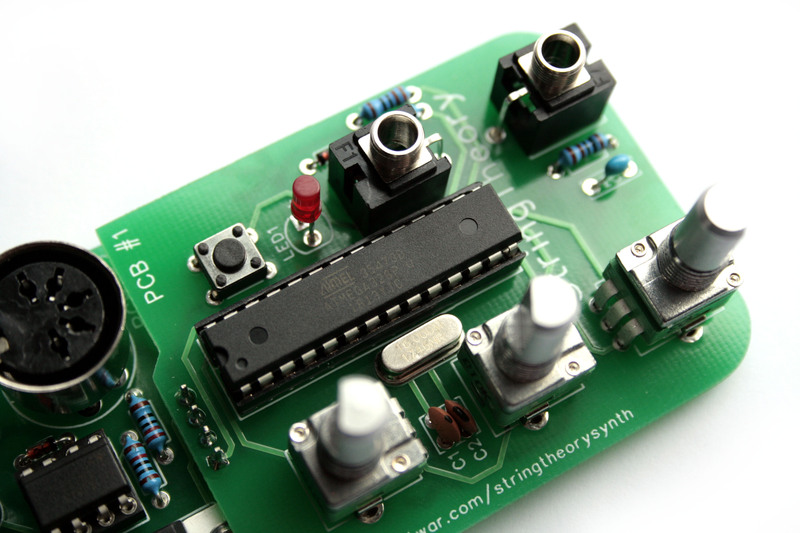 Whichever enclosure you use, your finished StringTheory Synth looks great, and is ready to connect up and use; take a look at the owner’s manual to see what you can do with it next! 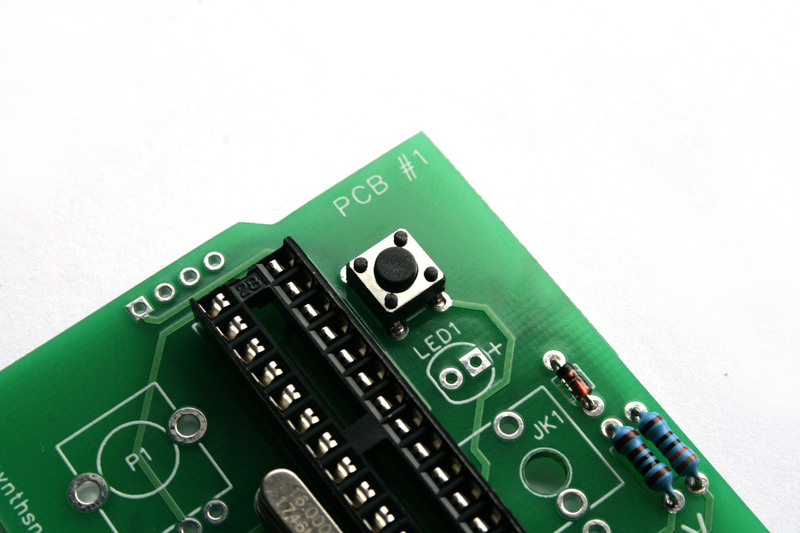 In addition to your PCB and panel, you’ll need parts. The full list of parts for the project is given below, with Mouser part numbers to aid you in identifying compatible parts. Although we’ve used all Mouser parts in the example build above, you may be able to obtain cheaper compatible parts by shopping around. JK1, JK2 3.5mm female Mono switched vertical jack socket 2 Thonk – “Thonkiconn” PJ301M-12 PCB designed for this exact part; DON’T FORGET TO BUY WASHERS & NUTS!